Tyrone duo Joe McMahon and Ronan McNamee are ruled out of this month's Ulster SFC encounter with Down at Healy Park because of injury. McMahon is sidelined with a calf injury after missing the Football League campaign because of a groin problem. 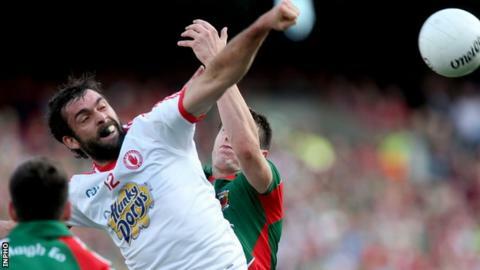 Defender McNamee picked up a shoulder injury in a challenge which saw him black-carded in the Football League Division One final against Dublin. Colm Cavanagh and Connor McAliskey are injury doubts. Midfielder Cavanagh has a quad injury injury which could keep him out of the preliminary round game on 18 May. Benny McArdle, Conor Garvey and Darren O'Hagan are among the Down players recovering from knocks but manager James McCartan is hopeful they will all be fit for the championship opener. "We've a lot of boys with knocks but hopefully all of them will be okay," he told the Irish News.